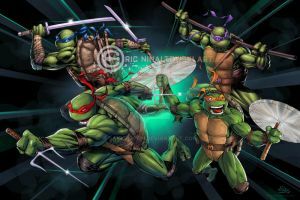 can you believe this is the first fanart I've done of the ninja turtles? I love these guys! I dunno why I've never drawn them before! Ohh, may I please use this as my wallpaper? It is just soooo awesome!!! Truly!!! Thanks for sharing!!! wow, this is freaking amazing! This is just sooooo freakin´sweet! And cool! And cowabungatastic! I love it! AWESOME first fanart! I freakin' love the original cartoon style! This is just PERFECT, I'm utterly blown away by the awesomeness! Well, you know what this means. YOU MUST DRAW MORE! lol! I really should, huh? Yes please! I shall commence begging now! Love the pic, great job. How I miss the good old days when cartoons were awesome.